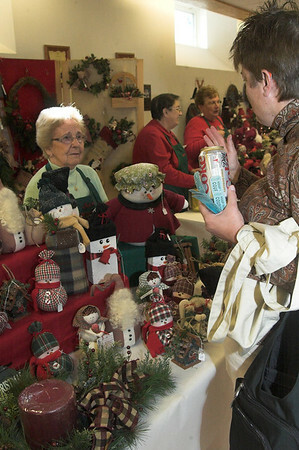 For more than 30 years, the St. Jude Parish Woman’s Guild has hosted the Country Christmas Fair during the first weekend of November. Each year, the fair features unique and carefully crafted items available for purchase. Many artistically skilled members of the Guild work hard all year creating a variety of items. Of these handcrafted items are floral baskets, snowmen and Santa Claus decorations, table runners, oven mitts and much more. The fair also features delicious homemade jellies, jams, preserves, herbal dips, and candies. Each year, members of the Guild create a queen size quilt to be raffled during the fair. The quilt is often made following a specific theme, which have included “Hunter’s Star” and “Winterberry Stars” in the past. The fair also hosts a number of activities for children, a selection of lunch items and the famous Cookie Walk. St. Jude’s Country Christmas Fair is a great chance to purchase homemade gifts for loved ones and enjoy some holiday fun in Londonderry. St. Jude Parish Country Christmas Fair is generally held the first Saturday in November from 9 AM until 5 PM. It is hosted at the parish hall, located at 435 Mammoth Road, Londonderry, New Hampshire. Browse this map for detailed directions.